Capital Books (VA), 9781933102887, 195pp. ** The American Society of Journalists and Authors (ASJA) awarded AMERICAN IDLE an Honorable Mention in the Non-Fiction category of their 2010 annual writing awards Congratulations to Mary ** For 99 percent of our history, humans have lived as a species on the move, but modern life has stopped us in our tracks. 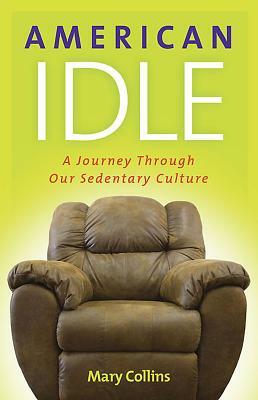 AMERICAN IDLE: A Journey Through Our Sedentary Culture offers the first comprehensive look at the social, cultural, moral and physical consequences of living in a sedentary culture that has immobilized us as effectively as a shattered body part. As author Mary Collins recovers from a devastating bicycle accident, she begins a journey to find out more about America's wounded national body. She discovers: * Why humans are meant to move. * What social changes led us to our current state. * Why past efforts have been so ineffective, and why will power isn't the problem. * How our impaired physical selves impact our social lives and moral judgment. In her pursuit, Collins: * Visits the Olympic Center, factory floors, archeological sites, city planners, health experts, and even the National Zoo. * Explores the hazards of a society centered on desk jobs. * Looks into why organized sports have made kids less fit and advocates for more free play. * Uncovers remarkable new research about how physical activity impacts the adult brain. * Talks with experts about the growing imbalance between our overactive minds and our underused bodies. * Offers advice on how to integrate movement into the natural flow of our daily lives again. In sum, AMERICAN IDLE offers readers a road map back to physical grace.